The fourth annual Gotham Classic came to a close with a couple of outstanding games. 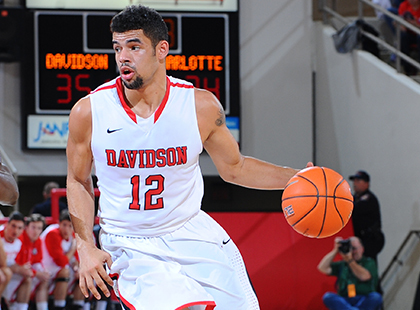 In Davidson, N.C., Jack Gibbs scored a Gotham Classic record 41 points while making a record 13 field goals to lead Davidson to an 81-77 win over Morehead State. Gibbs, who set the previous Classic standard of 37 points in the tournament’s first game against Eastern Washington, was 13-of-18 from the field, including 6-of-8 from three, and 9-of-12 from the foul line. 25 of his 41 points came in the second half when the Wildcats overcame a seven-point deficit with 11:36 to play by shooting 16-of-22 from the field in the stanza. Jordan Barham posted 17 points on 6-of-8 shooting from the field, Peyton Aldridge added 11 points, and Brian Sullivan had nine points and seven assists. For the game, Davidson was 28-of-47 (.596) from the field and 10-of-21 (.476) from three. Morehead State placed five players in double figures, led by Miguel Dicent and his 16 points. DeJuan Marrero recorded 12 points and 11 rebounds, Brent Arrington scored 15 points, Corban Collins had 12 points and five assists, and Anthony Elechi had 11 points. In Pittsburgh, Pa., Pitt overcame a 61-54 deficit with just over seven minutes to play to come back and beat Western Carolina, 79-73. The Panthers did it at the foul line, outscoring the Catamounts 29-8. They also did it with Jamel Artis, who led everyone with 29 points and eight rebounds. Sheldon Jeter and Michael Young each posted 12 points and six rebounds while James Robinson had 11 points, six rebounds, and nine assists. Western Carolina was paced by Rhett Harrelson and his 21 points. Mike Brown tallied 13 points, Elijah Pughsley had 11 points, and Justin Browning added 10 points and six rebounds.